Crime readers are always searching for books that have fast action, intriguing characters, and a plot that pulls you in. 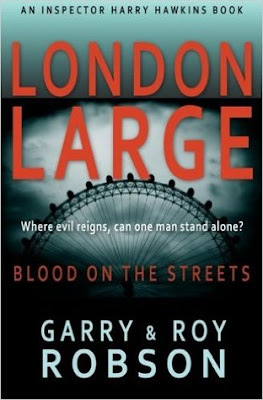 In "London Large: Blood on the Streets" authors Roy and Garry Robson accomplish all of this and more. The story of an old school London copper that finds himself under siege in a gang war. Can he see through a high-level conspiracy and rescue his partner from kidnappers? And will he step outside the law to do so? Populated with complex characters and plenty of action this novel is the first in a 3 part series that follows Inspector Harry 'H' Hawkins. Not quite Dirty Harry, but the next best thing. Even seasoned readers will be surprised by some of the twists as they are guided through the dark streets of London.